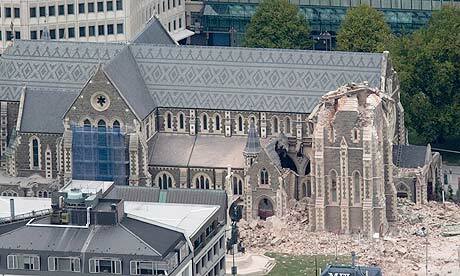 The recent earth quake in Christchurch NZ has seen the usual bigoted comments come out. I have heard it blamed on gays, women wanting equality and sinning in general. Mostly I ignore these types of comments as being from ignoramuses, uneducated, fearful people who know no better. But a few comments have got to me. One such recent comment on Facebook from a xtian friend was that it was ‘remarkable’ that no one was killed when the church spire in the square collapsed, with the implication being that god was somehow protecting people from dying in ‘his’ space. Needless to say this comment ignored the others killed in another church in the city. Why should it be ‘remarkable’, that ‘god’ stopped people dying in ‘his’ church? Shouldn’t we say instead that where was ‘god’ when people died elsewhere, shouldn’t that be the comment. 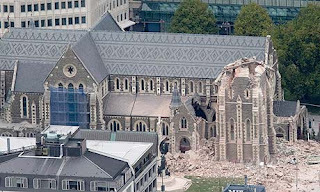 Shouldn’t we ask (if we believed in a god) where did the ‘love’ of god go, when people died underneath the rubble of the buildings of Christchurch? What is ‘remarkable’ is that anyone can think that just because no one died in one specific church, that ‘god ‘was somehow behind this and for some reason that only god can understand (a typical answer from xtians) the others who were unlucky enough not to be protected by ‘god’ were allowed to die. It breaks my heart when I hear these types of comments. It somehow robs the dead of their rightful place in our hearts.